When it comes to sewer line repairs, it’s important to be proactive. Sewer repair issues can get out of hand quickly, leading to costly and time-consuming repairs, not to mention the stress involved with having to deal with sewer line issues. Avoid having to replace old pipes entirely or sudden sewer line bursts by having your sewer lines checked regularly for cracks or other damages. Sewer lines are affected by a number of things. One of the most common factors that leads to sewer lines repairs or replacements are tree roots that grow into the pipes, causing them to crack, become clogged, or in some cases, even burst. While we all appreciate the beauty and benefits of having trees in our yards and neighborhoods, tree roots can cause major issues for sewer lines. If you’re experiencing disruptions in your sewer lines, the culprit could very well be that beautiful old tree in your front or back yard. The flat portion of the pipes – known as the “belly” – can collect debris that may lead to sewer line disruptions or clogs. The more debris collected, the more likely you’ll experience issues with your sewer lines, which can lead to sewer line back-ups (a rather messy – not to mention stinky – affair that the majority of us would rather avoid). In order to catch your sewer repair issues before they get out of hand, it’s important to call a plumber to come and make sure your sewer lines are functioning properly, free of cracks, clogs, or built-up debris. Over time, pipes will age and begin to deteriorate: it’s simply unavoidable. If you live in an old house or older neighborhood, it’s especially important to have your sewer lines checked before any issues get out of hand. You may need to replace your pipes altogether to avoid serious and costly damages. Old pipes will often contain cracks and leaks, or suffer from misalignment due to erosion, and they can fail at the most inopportune moments. 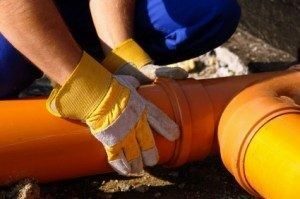 While replacing old pipes is often a costly and time-consuming business, trenchless sewer line repair is a great technique that avoids much of the hassle and damage to your property that is involved in digging up old pipes to replace them with new ones. With trenchless sewer line repair – a no-dig technique – new pipes are inserted into the old ones, minimizing the damage to your front or back yard. Instead of having to dig up large portions of land in order to replace old sewer lines and having to turn your property into a messy construction zone, trenchless sewer line repair involves only marginal invasion. Trenchless sewer line repair is also a lot quicker of a fix than the old pipe replacement techniques, so you can get back to your life as soon as possible. Need sewer repair in Los Angeles? Get in touch with our plumbers at Honest Plumbing to make sure your sewer repair issues are taken care of at the earliest. It’s important to have your pipes checked regularly so you can ensure you won’t face any unforeseen issues. Factors like erosion, weather, aging, and debris can all affect the quality and function of your sewer line pipes. Sewer repair issues can quickly get out of hand if they’re not monitored regularly.